You enjoy teaching and, like every other teacher, you want the best for every learner. Recently, you have found a steady stream of learners coming to your school with little or no English. You aren’t really sure how to provide the best possible education for them, when they are struggling to understand the English in your already differentiated lessons. 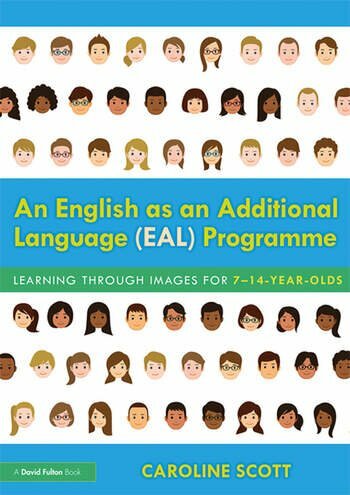 This book provides you with a programme for use as an induction-to-English, complete with integral assessment. It provides guidance on how to bridge the gap between these learners and their peers It is suitable for learners of any language background due to the focus on learning through images. It also includes suggestions on how to include parents who are new-to-English and ideas on family learning. You’ll find an EAL framework to provide structure to your EAL provision across the school, as well as guidance on how to approach class teaching. Developed from good practice in schools and informed by research, this programme is designed to move learners into English quickly. It uses a visual, structured approach that works alongside immersion in the mainstream. Session 5: What’s that in English? Session 20: Have you got …? Session 26: Do you / does he…? Session 27: Would you like …? Caroline Scott has a wealth of experience in supporting young emergent bilingual learners within culturally rich, internationally minded learning environments. Caroline has taught at schools Europe, South East Asia and the Middle East, where she has also trained other teachers in supporting language learning with the curriculum.